Slot Width (in): 0.600 in. Maximum Spring Diameter (in): 1.625 in. Sting the competition with Scorpion Race Series roller rocker arms. First, these fine Scorpion rocker arms are 100 percent made in the USA. Second, they're precision-crafted by high-tech manufacturing methods, and then fully CNC-machined. Race rockers offer more clearance for retainers and springs. For a great finish to these superior rockers, the surfaces are micro-polished for maximum durability and anodized for additional protection, plus killer looks. 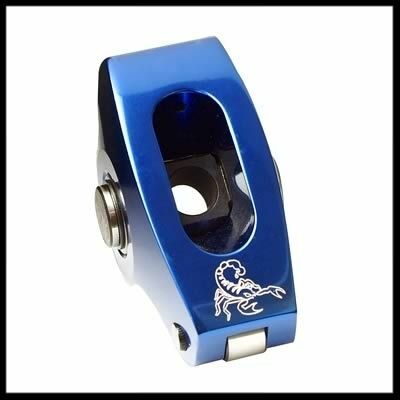 Sting, but don't get stung with lesser quality; if you want more speed and are passionate about American-made high performance, bolt on a set of Scorpion Race series roller rocker arms. If you’ve read our warning on engine builders using low grade no-name rods and cranks, a very similar situation exists in the roller rocker market. We do not use or sell off-shore, (no-name) roller rockers, period. They have proven to be faulty in many ways. The center trunnions are not polished, nor is the center of the roller tip true to size or polished. Metal fragments are often left inside the trunnion housing and will cause destruction of the needle bearings. The aluminum alloys used are never aircraft aluminum alloys as are used in all USA made roller rockers. They often mention the alloy as being 6061, and that is a very soft form of aluminum. The 6061 alloy used on these will assure rocker-flex on any higher than stock spring pressures, and this will affect performance. The pins and keepers that hold the parts together are often of poor quality and improperly installed. The front roller will usually scoot along the valve tip, as it can't roll properly due to rough internal surfaces. 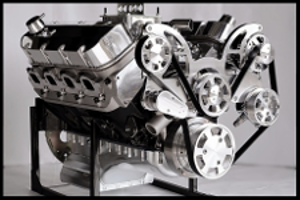 We use Scorpion, Comp Ultra Pro Magnum, and Comp Gold Arc rockers in all of our engines. The difference in these compared to the low grade no-name rockers on the market is huge. Do a Google search on this subject and you will know then what we’re talking about.